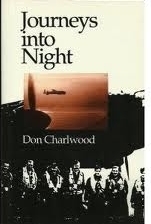 Many of you would have read Don Charlwood’s No Moon Tonight (1956) where, in a novelistic style, he tells of his experiences in Bomber Command. I consider that one of the best aviation books I’ve read. His 1991 book, Journeys into Night, is ‘up there’ in my ‘best ever’ list. As with the earlier book, Journeys into Night is also thoughtfully and lyrically written but this reflects the maturity of someone who is looking back on the distant past. Like No Moon Tonight it deals with the young Charlwood’s experiences in his bomber squadron but it also follows closely the experiences and fates of his training comrades and members of his crew. Charlwood uses extracts from his own diaries as well as the writings of his companions, so the reader is continually experiencing shifting perceptions: the fresh experience; the mature reflection. There is a strong bittersweet sentiment running through the account and the reader is constantly reminded that many will not return—there is almost a sense of a ‘countdown’. For example, ‘Two lads who sleep near me failed to return this morning’, he wrote to his young lass, ‘I woke when the rest came in and heard the news. I saw their belongings still in their places…It all happens so quietly that one does not realise that they have been victims of war’. Alongside the sadness, there is an occasional flash of that unmistakable brand of Aussie humour and irreverence. Like the time, for instance, they encountered the Station Warrant Officer, a florid, elderly-looking man. He wore the ribbons of ‘14–‘18 and would oft declare that he didn’t believe in parachutes. Of course, the boys, knowing they may need to rely on theirs to save their lives, quickly realised he was a ‘wingless wonder’, and doubted he had ever been high enough to need one! We were taken up to 28,000 feet, three of us with oxygen and three without. The three without all started well enough, but gradually became like drunks. Watching Harry work out simple division was excruciatingly funny…When his calculations reached the end of the page, Harry continued with supreme confidence down his trouser leg. Then the MO asked Charlwood to feel his oxygen lead. Charlwood found it plugged in, but the Doc informed him he had actually been unconscious until Harry had connected him. It was a real wake up call. If you can get your hands on this, it is well worth a read. Tinged with sadness and the inevitability of death, yes, but full of the joy of mateship and beautifully written.